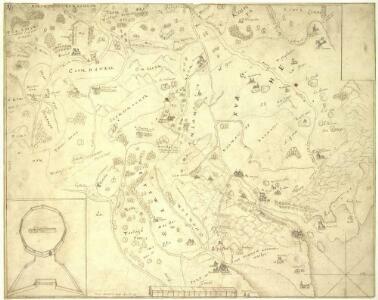 Description: This is a map of North East Ireland dating from 1600. An inset in the lower right hand corner shows the fortification of Fort Mount Norris. It is a remarkably detailed pen and ink rendering of the area between Lough Neagh and Dundalk. Details include vignette view of fortifications, fortified towns and churches, mountains in elevation, the names of local chieftains and plans of forts. It illustrates the campaign of 1600 which lead to the success of the Lord Deputy in forcing his way into the territory of the Irish leader O’Neill, although he was not able to penetrate further than Mount Norris between Newy and Armagh. By 1603 O’Neill and his allies among the Ulster Lords had been defeated and the entry of the English to the hitherto almost unknown area of central Ulster was then possible. This event explains why English topographical knowledge of this area suddenly increased in the first years of the 17th century. The cartographer of this map is thought to be Richard Barthelett who was the first cartographer to profit from this opportunity to complete the survey of Ireland. Barthelett was killed by Irish natives while surveying in Donegall in 1603 ‘because they would not have their land discovered’. It is interesting to note that Barthelett’s work was so accurate that it satisfies 18th century specification for military mapping. The formula of cartographic representation which he adopted matches that used by military engineers two centuries later. scale bar of 8 miles = 4" (1:120,000) inset 1":40 foot.